Welcome to the ominous island of Matador Prison. Isolated from any civilization, Matador Prison provides a natural deathtrap for any escapees. 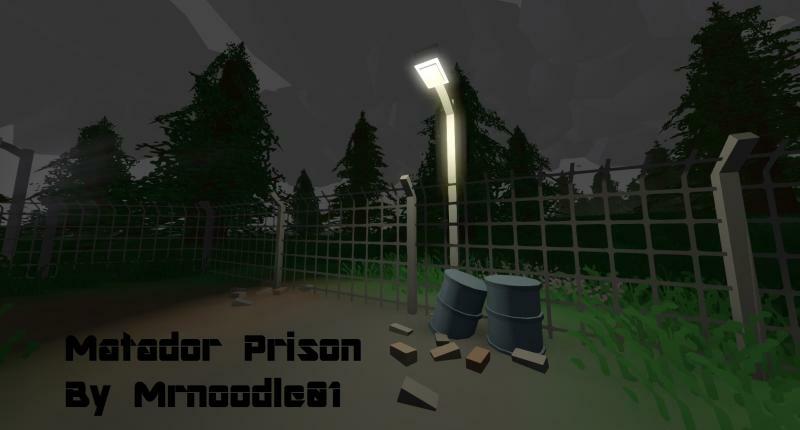 | Matador Prison is a small PVP map. Including dozens of exquisitely detailed sections, and smooth and fair PVP gameplay, Matador Prison is the perfect map to compete on. Don't get shot, and have fun survivors! Note: Matador Prison is a PVP map, not a survival map. There is no loot or zombies, it is meant to be for player vs player gameplay. Other Note: Matador Prison requires Fiff's Objects and Zyrmox's Light Pack. Make sure you have them! Make sure to rate and favorite Matador Prison! I strongly recommend using the loadout command while playing to make gameplay smooth and fun! Every ID you add will spawn with you after you die. You can modify or create your own loadouts, these are just the basics! Anther great map from you again, this one looks sweet i have to say, great job!